Picture a middle-aged woman who is very worried that her elderly father is continuing to live in the family home when, in her view, the time has long passed since he was capable of living there by himself. Next, visualize a widower in his eighties who is feeling pressured by his adult daughter to leave behind all that is familiar to him--his home and his neighborhood--and to move into an "old folks" home. Desperate because her father refuses to listen to her pleas that he sell his home and move into an independent living facility for retired people, the adult daughter decides to seek help from a professional who can assist the two of them in resolving their differences. Her search leads her to a person called a mediator and a process called mediation. The daughter learns that mediation involves two or more people who can’t agree on a solution to their problem plus a mediator--an impartial third party who has no stake in the outcome of the mediation. 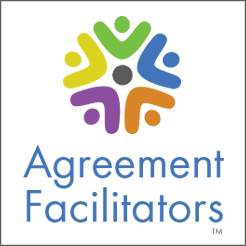 The process allows the people to express and defuse feelings, clear up misunderstandings and find areas of agreement which can be incorporated into solutions that the people themselves create. Encouraged by what she has learned about mediation, the daughter schedules a session with a local mediator. Her father reluctantly agrees to participate in the mediation only because his daughter is so insistent that he join in it with her. The mediation takes place in a meeting room at the mediator’s office. The names have been changed to protect the participants and the confidentiality of the mediation process. Anna Steele, the mediator, is at the head of the table. To her left is Harold Greene, the widower, slumped in his chair, obviously ill at ease. Tanya Ellison, Mr. Greene’s married daughter, sits across from Mr. Greene, appearing worried, fidgeting with her hands in her lap. The mediator begins by introducing herself to Mr. Greene and Ms. Ellison. She continues: "Before we start I would like to go over some ground rules. Each of you will have an opportunity to give me your account of the disagreements you’ve been having. I request that you be respectful, listen to the other person without interrupting and not use abusive language. Please express your feelings as fully as you possibly can. Later I will ask you to talk directly to each other." "One of the main reasons I am here is to help you with the process of talking to one another. I will not take sides nor will I let things get out of hand. After you have talked and listened to one another and you have considered and discussed options for resolving your differences, I will try to help you work out an agreement. You may not be able to reach an agreement at this first meeting, which is all right, too, but hopefully you will." Tanya Ellison: "I’m terribly upset because Dad just won’t listen to me and realize that he’s got to do something about his living arrangements. I love him dearly and I know that he simply can’t continue to live at home alone any longer. He gets dizzy sometimes, he won’t take his medication when he should and he doesn’t eat the proper food. I’m awfully afraid that he may fall and hurt himself and no one will be there to help him. Living 600 miles away, I certainly can’t be there when he might need me." Harold Greene: "I don’t know what she’s talking about. She talks like I’m nothing but a used up old man. The truth is I’m fit as a fiddle. I drive my car and I get out for walks three times a day. Just ask my neighbors, they’ll tell you how spry I am. And when I need something, they’re the first ones to help me. We’ve known each other for over forty years and we trust each other because we’ve been through a lot of hard times together. The only way I’m leaving my home is when they carry me out feet first." Tanya: "I know that Dad has a lot of friends in his neighborhood but they’re getting old just like he is and they’re not going to be able to live there indefinitely either. Ever since Mom died 10 years ago, Dad has hung on to the house for dear life because that’s where the two of them raised their family and it has lots of memories for him. But he won’t give any thought at all as to whether it’s the wisest course for him now. He thinks he doesn’t have any options. He simply has to look for a situation where he’s not by himself." "And I forgot to point out that Dad’s home is falling apart on him. The repairs on the house, which he used to be able to do, he just can’t do anymore and he refuses to hire contractors to do the work for him. The house is 40 years old and is really a mess. It needs new wallpaper and it needs new paint. He sure can’t do it by himself and he can’t expect his neighbors to do it for him." Harold: "All this nonsense about me not keeping my house up and needing to move into a retirement home--I don’t want to be around old people using canes and wheeling around in wheel chairs. Besides, if I moved into a retirement home, all my longtime friends and relatives would forget about me. I’m not what you’d call a social person. It takes me a long time to open up with people and trust them enough for us to become friends." Tanya: "Dad just isn’t being realistic. There are all kinds of activities and social programs at independent living facilities that are designed to help the people living there to get better acquainted. People don’t become good friends instantly but you can’t expect that. When they see each other day after day, they become friendly soon enough. Dad would do just fine at one of these places, but he just won’t admit it. Besides he needs to live some place where he can get three meals a day and where someone can make sure he takes his medication." Harold: "Even if I did get to know a few people after awhile, where would I get the money to buy into a retirement home? Where could I go and live as cheaply as I live now? I hear that retirement homes are really expensive. Most of them require a big payment before you ever set foot in your apartment. I just don’t have that kind of money. I suppose I could come up with the money to pay the entry fee by selling my house, but there would be big monthly payments after that. With my social security check, I barely make ends meet now as it is. It wouldn’t be long and I would be out of money." The mediator helped Tanya and Harold to continue expressing their specific issues, concerns and feelings until they agreed that they had said everything they wanted to say to her. Then she summarized what she had heard from each of them . Talking to a mediator who listened with an accepting, empathetic and nonjudgmental stance enabled each of them to feel fully heard and to better understand the other side of the disagreement as well. In the next phase of the mediation, the mediator asked Tanya and Harold in turn to speak directly to each other, restating his or her understanding of the other’s point of view. This phase continued until they both agreed that each one had fully understood the other’s concerns. It enabled them to understand the disagreement from the other’s perspective and ultimately to take responsibility for their part in the dispute. Harold did admit that he blacks out occasionally and is terrified when he recovers consciousness on the floor and doesn’t remember what happened to him. He also admitted that he doesn’t want to be a worry to his daughter, especially since she lives a considerable distance from him. He even told Tanya that what had originally seemed as her badgering him, he could now see was her way of showing that she loved him. Tanya was greatly relieved to hear that her father was more "in touch with reality" than she had thought and that he didn’t want her worrying about him constantly from her home 600 miles away. She apologized for having given no thought whatsoever to how much her father would miss the ongoing contact with his neighbors and relatives if he were to sell his house and move into a retirement facility. Harold and Tanya jointly considered a variety of options to remedy his circumstances, including health care services in the home, senior day activity centers, meals on wheels, a personal emergency response system as well as moving to a senior facility. Having heard her father’s concerns about not having enough financial resources to live in a retirement facility, Tanya offered to research the actual costs of living in various local facilities. She also said that she would arrange for an appraisal of her father’s home so that they could learn what he would likely receive in net proceeds if he were to sell it. Another issue that Harold raised was that he really didn’t know what it would be like to live in an independent living facility, since he had never seen one. He agreed to have Tanya drive him to a number of nearby facilities so that he could check them out first hand. Tanya also offered to talk with her father’s friends and neighbors and encourage them to visit him should he decide to move from his home. She also agreed that she and her husband would visit him regularly. In addition, she promised to encourage her adult children, Harold’s grandchildren, to visit him from time to time. At the end of the mediation session, after each of them had signed a form listing all of their agreements, as Tanya and her father got up from their chairs, they walked over to each other and embraced. They then walked out the door arm in arm, chatting amiably with each other. At the outset of this mediation, the disputing family members were caught up in victim talk, self-pity and blaming. They had judged each other and their mutual situations based solely on their own biased views. Their judgments were based on these preconceptions and they had refused to take a look at them in another light. Not open to other points of view, they were unable to consider that there are different ways of looking at the same situation. Through talking directly to the mediator and then to each other, the family members were able to tell their respective stories and to reveal how the incidents in the disagreement affected them. Private thoughts and feelings were discussed and examined in a completely informal, confidential setting. They gradually began to look at their own attitudes and actions and take responsibility for their responses to each other and to key events. The mediation process enabled the family members to examine the negative labels they had placed on each other and acknowledge the extent to which they had misjudged each other. This allowed them to deal with their real interests and eventually move from talking only about problems to devising mutually acceptable solutions. The family members participated in the mediation process voluntarily and they mutually agreed on the selection of the mediator. They participated directly in resolving their disagreements, which enabled them to have a sense of ownership in creating the resolution rather than being passive recipients of a decision imposed by a judge or an arbitrator. As a result of being directly involved in developing their own solution, they were more inclined to make a full faith effort to carry out the resulting agreement. The mediator guided the mediation process according to certain key principles. She maintained a neutral role and showed respect for the differing points of view of the family members, no matter how diverse they were. She avoided making judgments and refrained from giving the parties advice. She focused on helping them find their own mutually acceptable resolution. Finally, she acknowledged the essential principle that the decision to resolve rests with the parties themselves. The mediation process is ultimately dependent upon the good will of people and their willingness to communicate openly and honestly so that a sense of trust can develop between them. If they cannot reach a point in their dialogue of thinking what is called "win-win"--that is, mutual benefit--the process will break down. They will remain in a victim mentality and look to external organizations such as the courts to provide them with leverage to gain an advantage over the other party. Mediation requires a major shift in the way people view their world. It means giving up an oversimplified, "I’m right-you’re wrong" perspective for a more complex, multiple-cause understanding of conflict. In addition, it means surrendering the attitude that others know better how to solve our problems and accept the idea that we can take responsibility for our own decisions. People often go into mediations feeling cynical, untrusting and angry. They typically blame others for what has gone wrong. The mediation process enables them to give voice to these negative feelings and to ultimately transform them into vehicles for productive change. For families that are struggling to resolve intergenerational conflicts between aging parents and adult children, mediation can indeed be very effective! Jack Hamilton has held positions as an instructor at Stanford University, as a senior research scientist at the American Institutes for Research, as director of executive services at the Institute for Information Management, and as co-founder of The Information Group, Inc. He holds a B.A. from Harvard, an M.A. from the University of California, and an M.A. and a Ph.D. from Stanford. Jack believes we are at a time in the world when embracing diversity among people and groups is of vital importance. His mission as a conflict-resolution professional is to teach people how to realize their common destiny of coming to a truer understanding of who they really are, rather than what their thoughts about others often lead them to believe. Honored for her contributions to the field of mediation by San Mateo County and the California State Legislature.